Stunning Bungaloft On Exclusive Child Safe Court. Masterful Design With 18 Foot Ceilings, Hardwood Floors, Gorgeous Kitchen With Granite Counters And Breakfast Bar, Backyard Oasis With Heated Inground Pool With Brand New Liner . Finished Basement With 2nd Kitchen, Bath, Rec Room & Bedroom Ideal In-Law Suite. 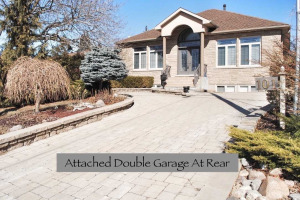 Double Oversized Garage With Access Into Basement, Luxurious Master Bedroom With 5 Piece Ensuite Bath & Spa Tub & Walk In Closet. 55 Foot Premium Lot! **Open House Today 2-4**Grand Staircase Leads To 2 Upper Bedrooms And Full 4 Piece Bath, Over 3000 Sq/F Of Finished Space, New Roof 2 Years, New Furnace 2 Years. Features: Brick/Stone Construction, Stamped Concrete Drive & Rear Patio.